Two-handed techniques are facilitated by the use of small-gauge instrumentation. 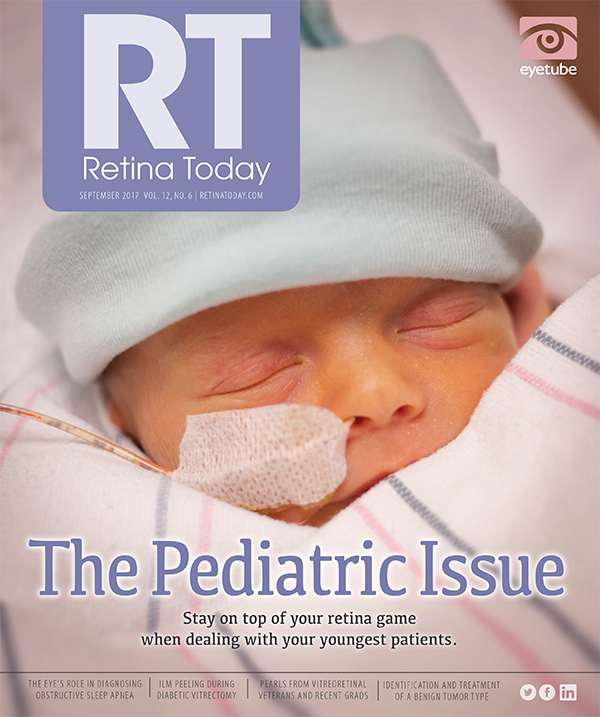 Tractional retinal detachment (TRD) and combined tractional and rhegmatogenous retinal detachment (TRD/RRD) are serious complications of severe proliferative diabetic retinopathy (PDR). Removal of proliferative fibrovascular membranes from the detached retina to release tractional forces and allow retinal reattachment is the key to treatment of this challenging situation. • TRD and combined TRD/RRD are serious complications of severe PDR. • Recent advances in surgical technologies and techniques in small-gauge vitrectomy have improved the safety and efficiency of surgery for diabetic TRD/RRD. • Bimanual maneuvers can help to reduce operating times and decrease the chances of complications in these challenging eyes. Since Robert Machemer, MD, pioneered closed-eye pars plana vitrectomy in 1968, followed by the introduction of the three-port intravitreal approach in 1972, conventional 20-gauge pars plana vitrectomy (PPV) has been the standard treatment for diabetic TRD/RRD, achieving good anatomic success.1-3 Recent advances in less-invasive surgical techniques and technologies have allowed surgeons to use smaller-gauge instrumentation for this surgery with equal or better results. In this article, surgical techniques and tools for performing bimanual maneuvers with MIVS in eyes with diabetic TRD/RRD are described. Figure 1. Bimanual technique using forceps to grasp the membrane edge to insert the port of a small gauge cutter between the proliferative membrane and the retina. In diabetic TRD/RRD cases, I usually use membrane forceps with a vitreous cutter to grasp and dissect broad membranes. With a wide-angle view, the forceps can engage the edge of the membrane easily to introduce the blunt tip of a small-gauge cutter into the tight space between the detached retina and adherent membranes (Figure 1). Most recently developed vitrectomy machines feature high-speed cutters with cutting rates greater than 7,500 cpm. These high cutting speeds allow the duty cycle to be maintained at more than 50%, dramatically improving the vitreous cutting efficiency of the small-gauge cutters—even 25-gauge and the much smaller 27-gauge—for membrane cutting and removal. The recently introduced double-port cutter, which features a second, internal port in the guillotine blade incorporated into the spring-pneumatic driven cutter, improves flow efficiency by maintaining the duty cycle without attenuation while increasing the cutting rate.8 This refinement dramatically increases flow efficiency during 27-gauge vitrectomy.9 The port of the 25- or 27-gauge cutter can be inserted readily between the fibrovascular membrane and retina, allowing successful membrane segmentation, dissection, and removal using the vitreous cutter alone instead of vitreoretinal scissors in most cases (Figure 2). In the most challenging cases, with thickened membranes strongly adherent to the retina, the combination of forceps with curved scissors is another option (Figure 3). In these cases, the edge of thickened fibrovascular membranes or large blood clots can be engaged by the forceps and then separated from the retina with scissors. After the separation, the membrane or clot can then be cut off with the small-gauge cutter using reduced cut rates. Figure 2. One-handed technique using a 27-gauge vitrectomy probe for membrane dissection. Figure 3. Bimanual technique for membrane dissection using forceps to lift up the membrane edge to insert small-gauge scissors to cut off the anchor between the membrane and retinal vessels. Bimanual membrane manipulation viewed through a wide-angle viewing system with chandelier endoillumination. Grasping the membrane edge with forceps, the membranes are separated from the retina, segmented, then dissected using only the multifunctional vitrectomy cutter. Thanks to the adjunctive use of VEGF inhibitors, uncontrolled intraoperative bleeding has become much less of an issue. 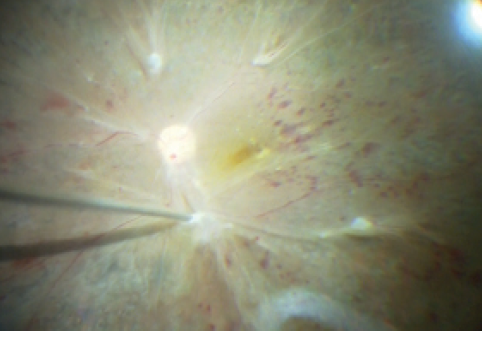 Even if bleeding occurs during membrane removal, it can be stopped in most cases with direct compression of the bleeding point with the blunt tip of the cutter.5 Reducing the use of cautery to achieve hemostasis may eliminate coagulative damage to the normal retinal vessels and the time wasted in instrument exchanges. This technique is facilitated using small-gauge instruments, but it may not be so easy with the less delicate 20-gauge vitreous cutters. If bleeding cannot be controlled with this technique, a bimanual technique can be used. In this approach, a back-flush needle is used to perform active aspiration to pinpoint the source of bleeding, and a diathermy probe is used to perform immediate pinpoint hemostasis. Another option is to use the proportional reflux function on the vitrector to draw out the blood and allow immediate pinpoint cauterization. Both of these techniques are helpful to keep the blood from reobscuring the bleeding point, which often occurs during instrument exchange with one-handed manipulation. The reduced need for instrument exchange with small-gauge instrumentation contributes to the efficient use of operating time, even in challenging diabetic cases. Figure 4. 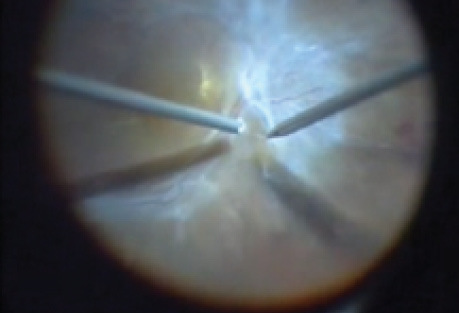 In a challenging case of TRD complicated with proliferative vitreoretinopathy, a double forceps technique is used to separate a strongly adherent membrane from the detached retina. In some cases of long-standing retinal detachment complicated by subretinal proliferation, a two-forceps technique can be used to peel strongly adherent membranes and avoid creating iatrogenic breaks (Figure 4). It is useful to peel the subretinal stands or membranes from small retinal holes using small-gauge instruments in a hand-to-hand manner to avoid enlarging the retinal holes. To visualize transparent membranes, it is helpful to stain them with a mixed solution of trypan blue and brilliant blue G dyes. With this combination, preretinal membranes are stained by the trypan blue and the internal limiting membrane by the brilliant blue G. Another tip is to peel the membranes under perfluorocarbon liquid, which helps to flatten and stabilize the detached retina so that membrane peeling can be accomplished with small-gauge forceps. Recent advances in surgical technologies and techniques in small-gauge vitrectomy have improved the safety and efficiency of surgery for diabetic TRD/RRD. Bimanual maneuvers, used in small-gauge vitrectomy with recently developed vitrectomy machines and wide-angle visualization systems, offer the best surgical options to reduce operating times and decrease the chances of complications in these challenging diabetic eyes. 1. Machemer R, Buettner H, Norton EW, Parel JM. Vitrectomy: a pars plana approach. Trans Am Acad Ophthalmol Otolaryngol. 1971;75:813-820. 2. Aaberg TM. Pars plana vitrectomy for diabetic traction retinal detachment. Ophthalmology. 1981;88:639-642. 3. Rice TA, Michels RG, Rice EF. Vitrectomy for diabetic traction retinal detachment involving the macula. Am J Ophthalmol. 1983;95:22-33. 4. Fujii GY, De Juan E Jr, Humayun MS, et al. 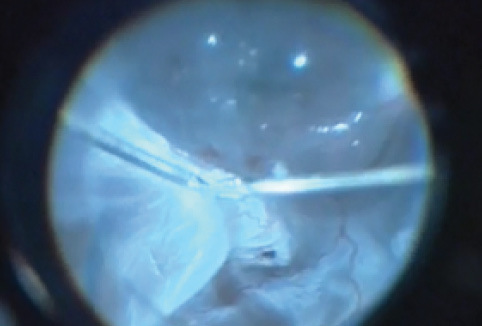 A new 25-gauge instrument system for transconjunctival sutureless vitrectomy surgery. Ophthalmology. 2002;109:1807-1812. 5. Oshima Y, Shima C, Wakabayashi T, et al. Microincision vitrectomy surgery and intravitreal bevacizumab as a surgical adjunct to treat diabetic traction retinal detachment. Ophthalmology. 2009;116:927-938. 6. Oshima Y, Wakabayashi T, Sato T, Ohji M, Tano Y. A 27-gauge instrument system for transconjunctival sutureless microincision vitrectomy surgery. Ophthalmology. 2010;117:93-102. 7. 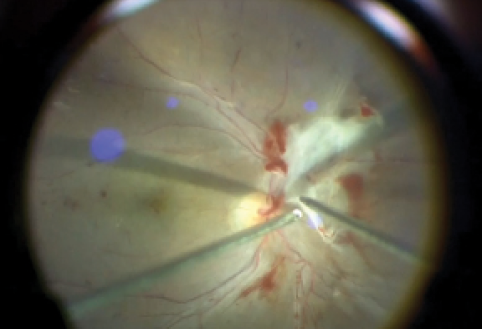 Oshima Y. Chandelier endoillumination in vitreoretinal surgery. Retina Today. 2013;8(1):68-72. 8. 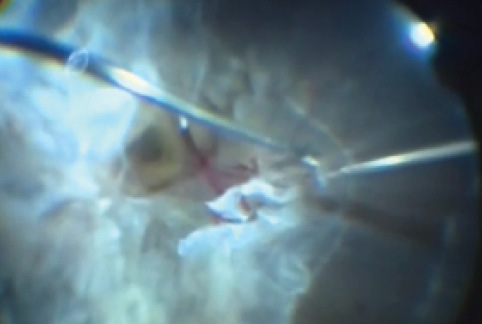 Rizzo S. Performance of a modified vitrectomy probe in small-gauge vitrectomy. Retina Today. 2011;6(6):40-42. 9. Yoneda K, Morikawa K, Oshima Y, Kinoshita S, Sotozono C; Japan Microincision Vitrectomy Surgery Study Group. Surgical outcomes of 27-gauge vitrectomy for a consecutive series of 163 eyes with various vitreous diseases [published online ahead of print January 4, 2017]. Retina.